One of my favorite potato dishes is my family's tradition of palt. Palt is one of those amazing, hearty potato dishes that is not well known. In elementary school I naively assumed that everyone knew about the wonderful palt, but I was shocked to discover that my teacher did not know how to spell it. Palt, in family lore, is an Eastern European dish that was passed down to us through my father's Swedish ancestors. Therefore palt was one of the few dishes that my dad cooked. Palt sounds disgusting, being a boiled mixture of shredded raw potatoes and flour. The raw palt which has the texture of meatless ground meat, is shaped into hamburger-like patties. My dad would boil the palt in two huge roasters, spanning two burners each, until the tiny kitchen windows were streaked with condensing steam. The large, gelatinous, white mounds are virtually tasteless and are consumed for supper, with a large pat of butter on the side of the plate. Palt, served the next day for breakfast, is the perfect meal. 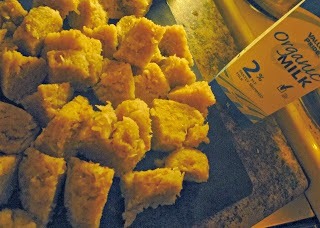 Leftover palt patties are cut into cubes, and fried with milk. The milk is cooked until the cubes of palt are warm and covered with a thick, white, gluey, starchy palty goodness! There is a proper and improper way to consume palt. The proper way is as follows. One cube of palt, covered in milk glue, is placed on a huge pat of butter. Hold the hot palt against the butter until the butter turns from an opaque yellow solid to a liquid. Consume the cube and begin again. The improper way to consume palt is to mix the butter into the milk glue covered cubes as this way of consuming palt does not allow the proper freshly melted butter to palt ratio. Consume only palt cubes thoroughly covered in milk glue. If this is not done, there will be too much milk glue left on your plate at the end of the meal. Also,no matter what happens, place the empty plates in hot water immediately after eating. The milk glue dries into an impossibly hard crust if not cleaned immediately. Palt may sound disgusting but trust me it's a wonderful dish! Palt is starchy, warm and gooey consumed with large amounts of butter fat, and milk fat. There is nothing that can go wrong with this combination of carbohydrates and fat! There are many versions of palt and it appears that the filling-less version is known as flat-palt. It appears that palt is commonly filled with ground meat and boiled in the same manner that a dumpling would be. Also flours made from barley and rye are commonly used. I plan on exploring these other traditions that involve palt.